Obesity is when a person has excessive weight with a body mass index of 30. Morbid obesity is when a person has excessive weight with a body mass index of 35 or 40 or more. Obesity is the condition in which a person has a body weight that is considered to be excessive as indicated by a body mass index of 30 or higher. People who are obese often complain of tiredness and back pain and joint pain. They tire easily when completing mild exercise and often become short of breath. They also often snore and they have problems with low self-esteem. Obese individuals have more fat than the average person who is overweight. The condition is diagnosed by measuring height and weight and using the body mass index (BMI) formula to determine where their weight falls on the BMI chart. Sometimes a measurement of waist circumference in addition to a body composition analysis is also done when diagnosing the condition. A value of 30 or greater indicates obesity. The causes are likely to be a combination of several factors including genetics and environment. Genetics can impact how energy is spent and how fat is laid down in the body. Environmental variables include eating habits and lifestyle factors such as activity levels. Low activity and increased intake of food can cause the condition since not enough calories are then burnt relative to how much is taken in with food. 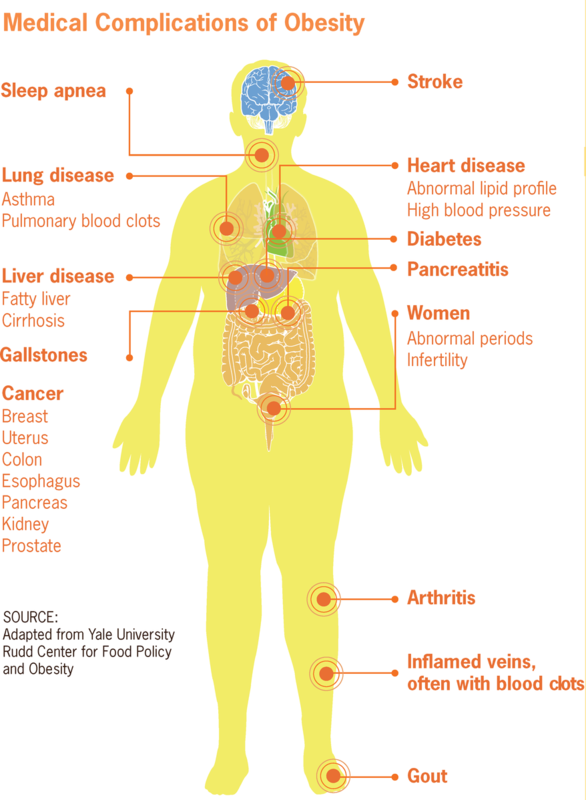 Certain medications and medical conditions can also cause obesity. There are multiple complications from being obese. Diseases such as diabetes type 2, liver and gallbladder problems, cardiovascular disease, cancer of the colon and breast, gastroesophageal reflux disease (GERD), and even sleep apnea are likely to develop if you are obese. Risk of death is slightly higher than a person of normal weight because of these complications, particularly after about 15 years. Diet and lifestyle changes are recommended. Patients are encouraged to eat smaller portions of healthier foods and to increase their activity level greatly. Certain medications may be prescribed along with psychological therapy. Bariatric surgery is not a recommended treatment for people who are at this level of obesity (with a BMI of less than 35). Morbid obesity is the condition in which a person has a body weight that is considered to be excessive as indicated by a body mass index of 40 or higher or 35 or higher along with health issues related to obesity. What are the Symptoms of Morbid obesity? People who have morbid obesity will have similar symptoms to people who are obese, but their ability to tolerate any exercise is very limited. They tend to have great difficulty in moving too much and also have joint and back pain. They also have trouble catching their breath if they do move and they are likely to have sleep apnea and snoring. Morbidly obese people will show excessive deposits of fat on the body. How to Diagnose Morbid obesity? Obesity is diagnosed by calculating a BMI for a patient and noticing that either the index is 35 and the patient has obesity-related illnesses such as diabetes type 2, or they have a BMI reading of 40. They are also at least 100 lbs. more than a healthy weight. The causes of morbid obesity are often the result of an interaction of environment with genetic factors. Scientists have found that there are genetic changes that can place a person at higher risk of morbid obesity. The risk of extreme obesity is also higher in people who have a sibling or parent who is obese. The environment also plays a role and can greatly contribute to morbid obesity, especially when people make poor food choices and eat large portions. This combined with a sedentary lifestyle puts a person at risk of becoming morbidly obese. The major complication of morbid obesity is heart disease and in fact, this is the main cause of death among the morbidly obese. People are also likely to develop type 2 diabetes, high blood pressure, osteoarthritis, and digestive problems such as liver and gallbladder disease, and GERD. Skin infections become more likely and people are at greater risk of cancers like breast and colon cancer. Risk of death in a morbidly obese person is higher than an obese person and can be as much as 12 times higher than a person of normal weight. Morbid obesity often is best treated with bariatric surgery in which the stomach is either made smaller or part of the digestive tract is bypassed. Patients also need to learn to eat small portions of healthy food and to burn calories by exercising. Psychological therapy may be needed as well, and medication may be used. Obesity is the condition of excess weight where the BMI is 30 or more. Morbid obesity is the condition of excess weight where the BMI is 35 or 40 or more. In obesity, the BMI is 30. 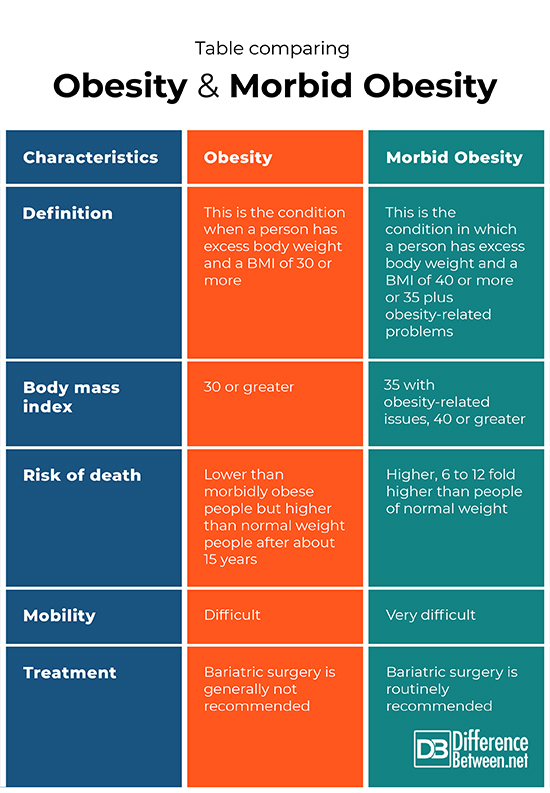 In morbid obesity, the BMI is 40 or greater, or 35 with health issues related to obesity. The risk of death of an obese person is not as high as a person who is morbidly obese. A morbidly obese person has a higher risk of death than an obese person and can have as much as a 6 to 12 times greater risk of death than a person of healthy weight. Moving and exercise for an obese person can be difficult. Movement in a morbidly obese person is extremely difficult, with exercise being equally challenging. Obese people are best treated with a combination of changes in diet and activity levels, along with medication. Morbidly obese people are often best treated with bariatric surgery in addition to changes in lifestyle. Obesity and morbid obesity are both conditions that can result in illness such as diabetes or heart disease. Symptoms are similar in both morbid obesity and obesity, but morbidly obese people are even less able to exercise or move. Obesity can be treated by a change in diet and exercise. Morbid obesity is often best treated by bariatric surgery. Dr. Rae Osborn. "Difference Between Obesity and Morbid Obesity." DifferenceBetween.net. January 17, 2019 < http://www.differencebetween.net/science/health/difference-between-obesity-and-morbid-obesity/ >. Busetto, Luca. "Timing of bariatric surgery in people with obesity and diabetes." Annals of translational medicine 3.7 (2015). Christou, Nicolas V., et al. "Surgery decreases long-term mortality, morbidity, and health care use in morbidly obese patients." Annals of surgery 240.3 (2004): 416.